Dhaka, 12 Jan, Abnews: Things took a shocking turn when the world’s hottest desert—the Sahara Desert in Africa—was pictured covered in snow. Swirls of white snow in the orange dunes actually looked like some kind of latte art, says the Indian Express. 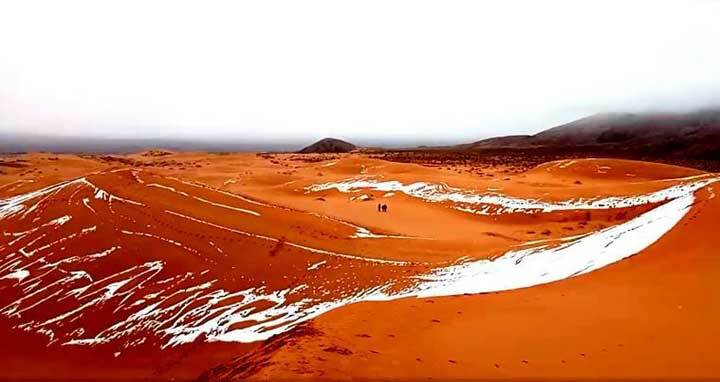 On January 7, Ain Sefra, a desert town in Algeria, also known as the ‘Gateway to the Sahara’ – where the Atla mountains meet the Sahara Desert – received snowfall. While some reports said that parts of the desert was covered with up to 16 inches of snow, a report in CNN said that the town officially reported less than one inch of snow. This is not the first time such pictures have gone viral. Last year too, the snow-sightings in the Sahara Desert had mesmerised people around the world. Reports also suggest that before that, it snowed in Sahara way back in the month of February in 1979.